In November 2008 I purchased an attractive old female mask on Ebay™. 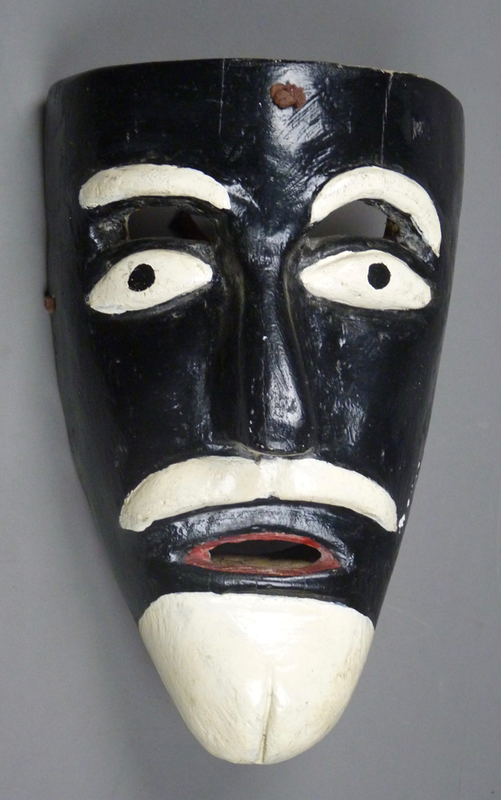 The seller described it as a Zoque mask from the Mexican state of Chiapas. I was intrigued by that description and after winning the auction I asked the seller for more information. There was no reply. I concluded that this was one of those familiar situations where a seller is guessing about the identity of an object in order to pitch it. I like it a lot, whether correctly identified or not, but what is it really, I wondered. Then and now, a search of books and the Web did not reveal such a mask from Chiapas. Ten years later, I decided to hazard a guess for myself. Here is the mask. This is an old and heavily worn mask, judging from the patina on the front and the back. In general, it looks like a mask of Malinche from a Conquest dance in Guerrero. For example it has applied ears, something one often sees on masks in Guerrero. Also, this is a paint color that can be found on Tenochtli masks, a style of Conquest mask. In Donald Cordry’s book, Mexican Masks, there are dance photos and some masks from la Danza de Tonochtli, which demonstrate this resemblance. For example, plate 19 on page 16 shows a photo of a very old female mask of Abuela Teresa (Grandmother Theresa) from San Miguel Oapan, Guerrero. Other dance characters in this portrayal of conflict between Spanish forces and Native Americans include Cortez, Indian kings, and Malinche, Teresa’s daughter. The paint is entirely worn off of Teresa’s face, and there is no trace of red pigment. However, on page 34, plate 38, Cordry includes a photo of red faced Malinche masks from the Tenochtli dance; “both are painted red to signify lust and wantonness,” said Cordry. Then again, this color may simple be intended to identify an Indian character. A dance photo from Acatlán, Guerrero, on page 220 includes a pink-faced Malinche, who is wearing a feather headdress and carrying a bow and arrow. You may recall that Malinche is sometimes viewed in Mexico as a traitor , because she helped Cortez to defeat the Aztec Indians, even though she was an Indian herself. This attitude leads Mexicans to portray her with disrespect. Cordry’s explanation of the color may reflect this attitude. When I was gathering together Moro masks from the State of Mexico, I was surprised to discover that there were all these Moors from Guerrero and Puebla that I had never shared with you. Today I have four more from Guerrero, and no two alike. The first of these is unusual because it is entirely black, except for white facial hair. I did include another black mask with the Archareos, two weeks ago , as those were all from Colotepec, Guerrero. I bought this one (and the next two) from René Bustamante in 1994. It was said to be from Atzacoaloya, Guerrero, but this mask does not show up in videos from that town or from the County Seat of Chilapa de Álvarez, so I don’t know where it fits in. This is a dramatic and effective mask. It does have a Moor’s mouth, anxious or fearful. Maybe it was worn by a Moorish leader. We should recall that when the Spanish missionaries introduced the Dance of the Moors and Christians, so many centuries ago, the Indians of the Americas would have had no experience with Islamic peoples. They would only have known what the Spanish told them. In this context, we find that the Moorish Leaders in this dance are named for a variety of enemies of Christendom, including Mohammed and various Roman Emperors. But how should these be depicted? In traditional images of the Three Kings in the Christmas tradition, one of the kings is often depicted with dark skin; perhaps such exotic images contributed. In today’s post I will discuss a single remarkable mask. I purchased this from Robin and Barbara Cleaver in 1995, but they had only recently obtained it from Spencer Throckmorton, and Spencer reported that it was previously owned by a famous 20th century Mexican collector and antiquarian, Raul Kampfer. It appeared to be a mask depicting a Moorish leader or king, perhaps it depicts Pontius Pilate, Herod, or the Emperor Tiberius, and it was probably used in the Moors and Christians dance drama (the typical frowning mouth of a Moor is apparent). 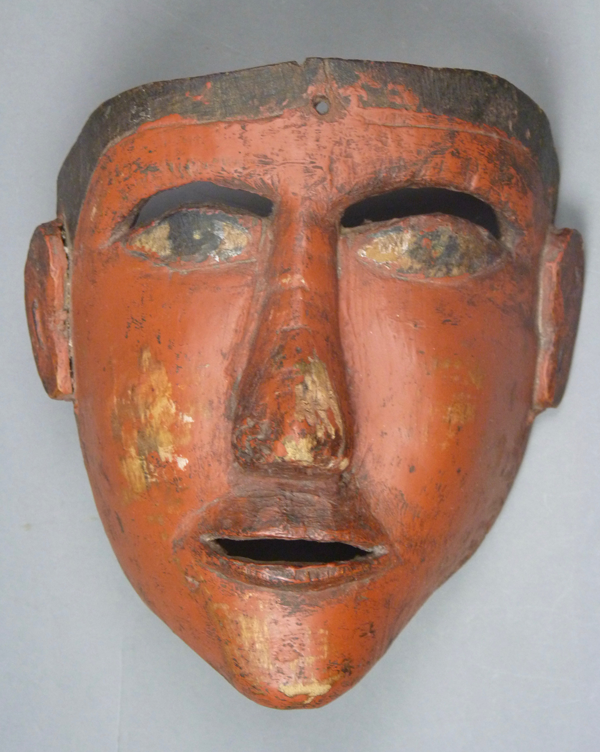 What was not known was the place in Mexico where this mask was carved and danced. Over the last 20 years I have searched through many books, looking for a mask of this unusual appearance, and I have only found one similar example in a dance photo— En El Mundo de la Máscara (page 58, left), “Danzante con máscara de rey, Sierra de Puebla” (dancer wearing a mask of a king). 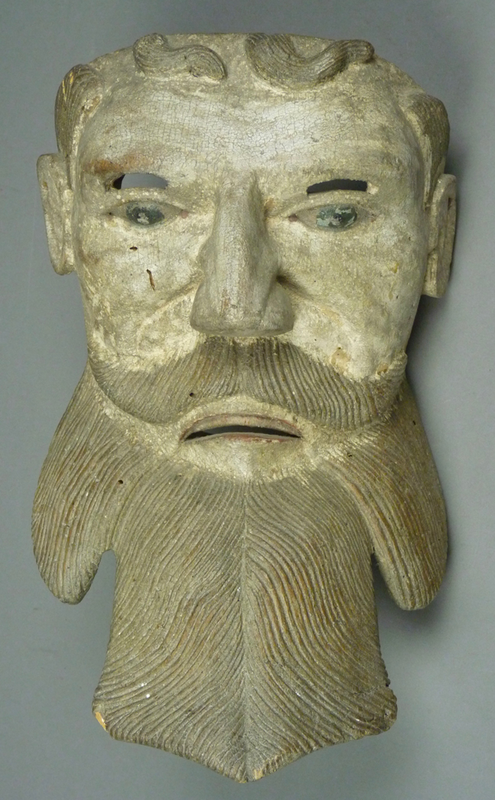 That mask has a single-lobed beard flanked by enormous sagging ears, so that it resembles this one in appearance, or at least more closely than any other mask I have seen. Note that the Sierra de Puebla is conventionally thought to include parts of the Mexican States of Puebla, San Luis Potosí, and Veracruz, but used loosely it can also refer to the Pacific highlands of Guerrero as well. To my eye, this looks like a mask from Guerrero or the State of Mexico, although one can find such finely carved ears in Guerrero or Puebla. Obviously it is very old, and we may never find another that has survived. The design of this mask is so elaborate. The fancy hair, for example, reminds me of Colonial carved wooden images from Mexico or Guatemala of el Padre Eterno (Eternal Father, or God). But of course it calls such images to mind, because such a refined mask would have necessarily been carved by a santero, drawing on imagery borrowed from images of God and the Saints. Here is an image of God from Guatemala. 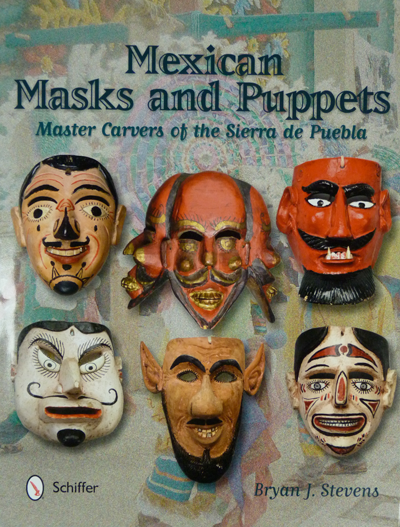 Donald Cordry introduced many collectors to Archareo (archer)masks in his well known book, Mexican Masks (1981, pp 232-4). The Archareos perform a variation of the Conquest dance, which is of course itself modeled on the Moros y Cristianos. All these dances have the common theme of Spanish Christians versus some opponent, such as Moorish outsiders or indigenous peoples. Victor José Moya Rubio included two Archareo traditional wooden masks and headdresses, one from Colotepec and the other from Pueblo Viejo, in Máscaras: La Otra Cara de México/ Masks: The Other Face of Mexico, Plates 54 and 55, on page 63. He also showed Archareo masks from San Martin Teotihuacan, in the State of Mexico, where Santiago wears a mask cast in lead and the Archareos wear masks made from painted and folded felt hats. A beautiful Archareo mask with headdress from Pueblo Viejo, Guerrero decorates the cover of El Tierra y El Paraíso, a catalogue of masks in the collection of Rafael Coronel (1993, pp. 20-21). 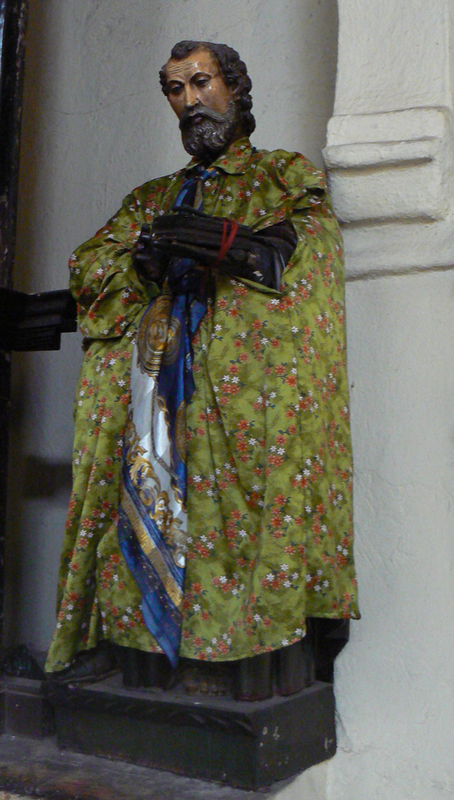 In Changing Faces: Mexican Masks in Transition,on page 69 (plate 102) there is a classic Red-faced Archareo mask that has been paired with the white headdress of Santiago or one of the Christians (provenance unknown), and on page 59 there is another of those Santiago masks cast in metal. These metal masks include headdress elements that are part of the casting. Here is a link to a photo of a mask in this metal style. This mask, however, is virtually identical to another in Mask Arts of Mexico, by Ruth Lechuga and Chloë Sayer, plate 96 on page 69, which the authors state is constructed from fiberglass and resin, plus tin for the headdress. Today I will share three traditional wooden Archareo masks like the one from “Cacalotepec” in Cordry, the ones from Pueblo Viejo in La Tierra y El Paraíso, and those in Moya Rubio’s book, along with three headdresses. These masks and headdresses were collected in Guerrero by a picker or “runner” for Robin and Barbara Cleaver. I am uncertain whether the runner had recorded which mask went with which headdress. It seems obvious that the white “Christian” masks would have been worn with white headdresses bearing a cross and the red Moro masks would be worn with other headdresses that lacked a cross. It only later became apparent to me that there was variety in the white masks and their headdresses. In May, 1988, Robin and Barbara Cleaver had sold me a handsome pair of Archareo masks, one a white faced Christian mask with a headdress topped by a cross, and the other a maroon mask with no cross on the headdress. Here is the white mask. In the years that followed, I compared this mask to a few other Archareo Christian masks from this area, and realized that mine was unusual, in that it had an oval goatee that framed the usual snouted mouth. Indeed, it has an elegant abstract goatee; I never saw another one like it, over nearly 30 years time. I concluded that this mask, bearded among so many that are beardless, might represent Santiago. 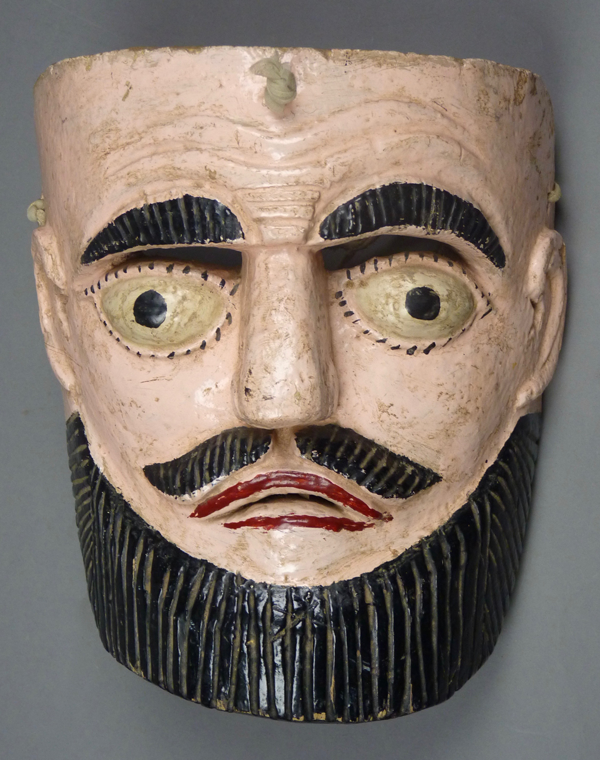 To state this in another way, Mexican Santiago masks in general usually have beards, while most Archareo masks do not. This week I shift my attention to Moro masks from Guerrero. Once again I will begin with a trio of masks that appear to be by the same hand, and collected from the same town, in this case Altamirano, Guerrero. I purchased the first two from René Bustamante in April, 1994, and the third one on EBay eleven years later, in November, 2005. 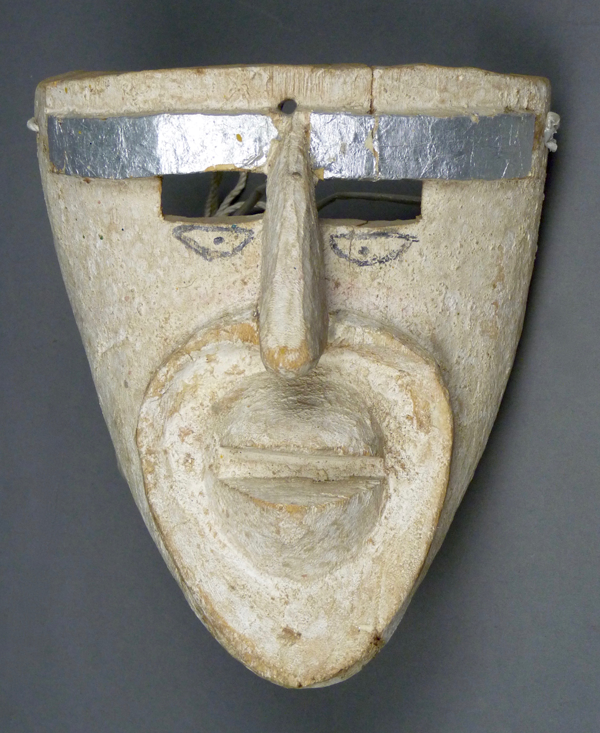 This mask came with a name—Mahoma (Muhammad), who would have served as the leader of the Moros in the Altamirano version of the Dance of the Moros y Cristianos. In a YouTube™ video from Altamirano in 2017 we find Mahoma wearing a mask just like this one, along with a black lunar headdress like those seen in the State of Mexico and a black cape that is covered with stars. He is accompanied by a similarly dressed small boy who is wearing a mask like the third one in today’s post. The boy evidently represents Mahoma’s son ( seen for instance at 11:30). Later Mahoma clashes swords with Santiago, the leader of the Christians, who is wearing his usual horse on his waist (17:30).